Hey, Ladies! Today is What’s Up Wednesday, but I over-scheduled myself! #oops #badblogger You can still link up at the bottom of this post, or you can hop over and link up with Shay or Mel! You for sure need to at least go over and see what the other girls are up to! So I couldn’t do the What’s Up Wednesday post today because it’s time for the 13th installment of Conner’s Closet!!! I can’t believe we’ve been doing this for over a year now! Thank you Conner for all of the incredible WORK WEAR ideas over the last year!!! In case you are new here, Conner is my little sister, and she works in HR for a hospital system. Here she is with her little guy, Brody (4 years old). I MEAN. HOW CUTE ARE THEY. But lemme tell ya, don’t let this precious picture fool you. That boy will give you a run for your money. And so did his mama when she was little. #sassy #karma ???? Conner always looks so polished and put together, and since I often receive requests for work wear ideas from y’all (but I don’t have the need for work wear), I had an idea to start a monthly series where Conner highlights business casual attire for us! She’s got lots of amazing pieces to show y’all today, so let’s get started! Conner’s thoughts are in italics. And if you don’t work in an office, don’t worry! Lots of Conner’s outfits are also great for church, events, weddings, showers, etc…. GREAT NEWS TODAY!!!!! Conner’s outfits are all from ANN TAYLOR today, and with the code THANKFUL you can 50% OFF EVERYTHING!!!!! Conner, this combo is sooooooooooooooooooo much fun! I love all of your looks, but this one is really special! You look absolutely DARLING, but super professional at the same time. I love the high neck and the simplicity of the top with the sassy (but not too sassy) skirt! This is a great look! Well done, sister! What Conner had to say: This skirt and top combination is my FAVORITE outfit to date. I love a good plaid skirt, but I don’t want to look like I’m wearing a uniform. 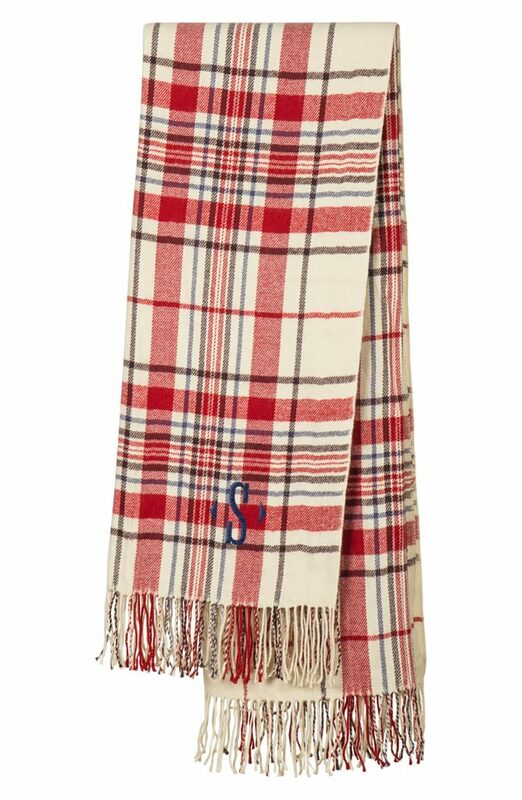 The glen plaid is perfect – it’s tiny, not too bold, and doesn’t scream “Catholic school girl”. 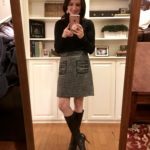 I have the tendency to gravitate towards pencil skirts and decided to go out of my comfort zone with the “flounce” look…and I’m so glad I did! How cute is the little ruffle at the bottom?!? Love, love, love. I recommend wearing a very basic black top as not to take away from the design of the skirt. This black turtleneck has my heart. 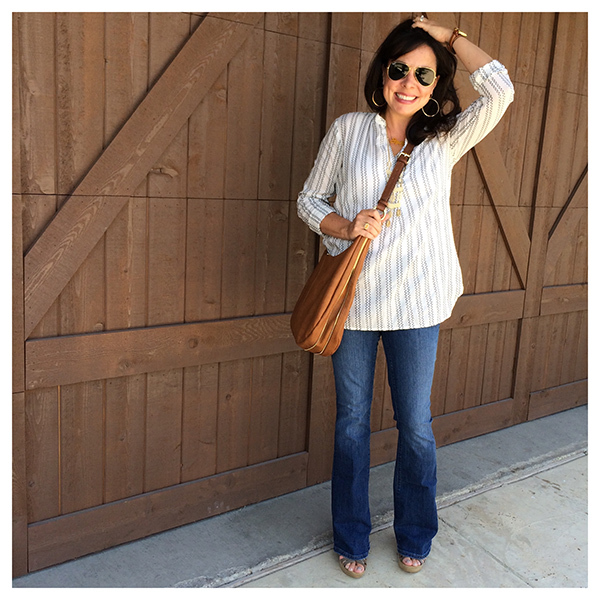 It’s comfortable, looks GREAT on, and can be worn tucked or un-tucked because it has side slits and a ribbed hem. I promise you this turtleneck will be a staple in your closet. It comes in a bunch of other colors too! I’m wearing my Sam Edelman Hazel suede pumps, but this outfit will also look super cute with tights and boots! Everything is true to size (Skirt = 00 Petite, Turtleneck = XS Reg). Both the skirt and top are machine washable. I will lay both of them flat to dry. Conner, when grabbing the links for your outfit, I also found a pair of pants that I loved! If you are a reader that prefers pants to a skirt, you can find the pants in the same plaid pattern HERE. AND LADIES! Both the skirt and the top went on SUPER SALE last night. The skirt was regularly $98, and now it’s $39.99! The top was regularly $49.99, and now it’s $29.99! And then she took the sweater from above, and styled it casually with jeans and leopard wedges. I’m DYING over the leopard wedges, and Conner is HEAD OVER HEELS over these leopard wedges. And they are on SUPER SALE today for 39.94! WHAT A DEAL! Conner says the wedges are “true to size and extremely comfy. Can wear them all day! Feet don’t hurt and you won’t get blisters.” They are final sale, so keep that in mind…but from what Conner says, I think they sound like they might be worth the risk! I highlighted this dress a couple of weeks ago, but here it is again! 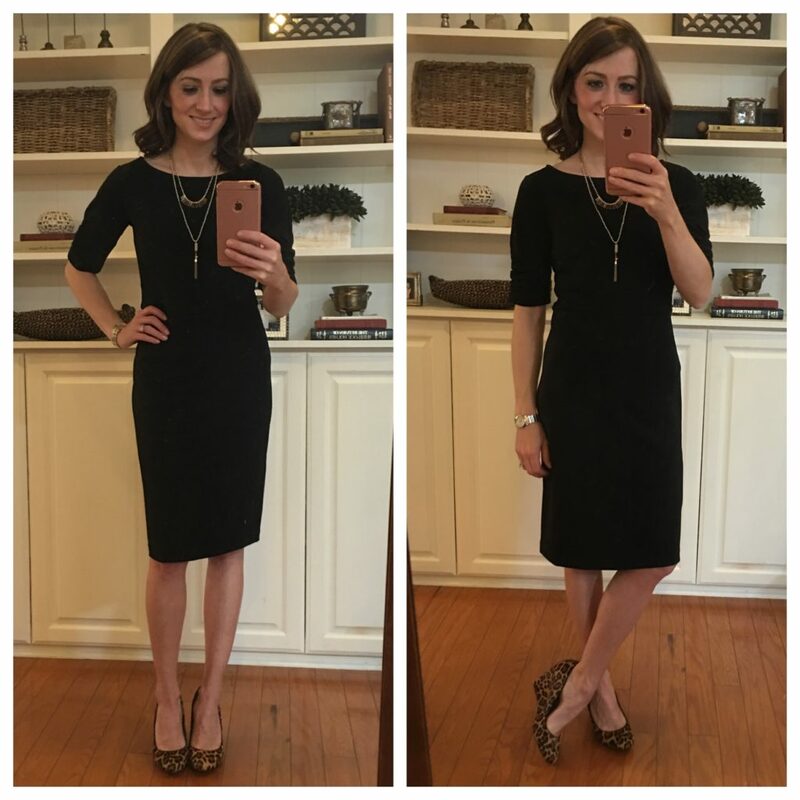 The dress is a great basic black dress that would be a wonderful staple for just about anybody’s closet. It’s got a little extra oomph with the ruched sleeves, but it’s a classic that will never go out of style. 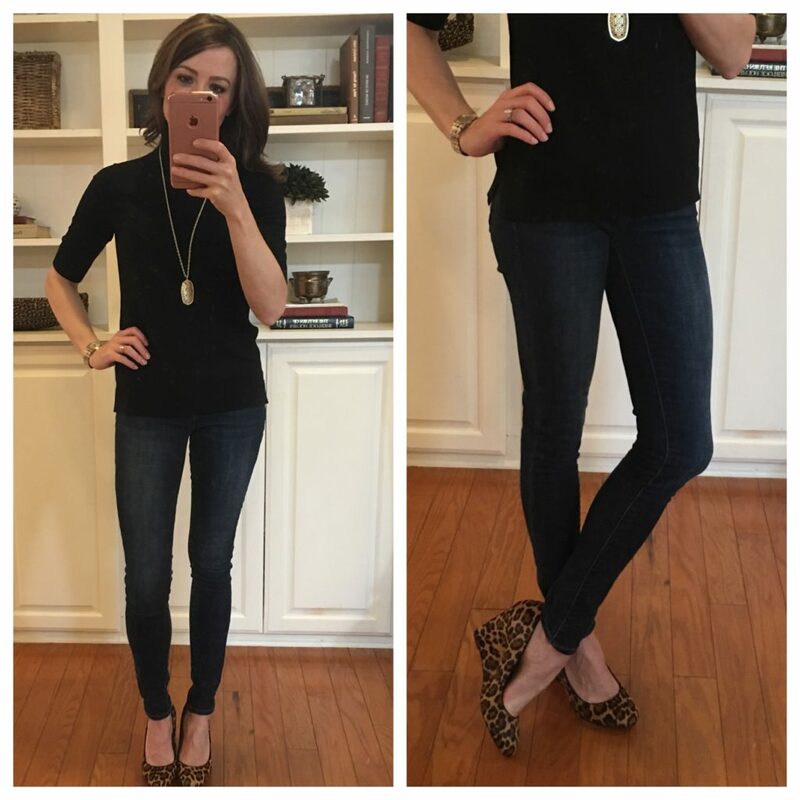 Conner loves that it has sleeves for the office, and I love it paired with the leopard wedges! She also said it could be dressed up for a wedding with fancy jewelry, but it’s basic enough that it would also be very appropriate for a funeral. The dress is true to size as well. With the code THANKFUL this dress is ONLY $64.50, regularly $129! And here it is styled with a scarf. Sadly, this scarf is now sold out, but I still wanted to show you the picture so you could have another idea for how to wear the dress! As you can see, it dresses up really easily with heels. Conner, you are the queen of the pencil skirt! You always look great in them, and I love that this one is tweed! What Conner had to say: How fantastic is this skirt and top combination?!? I’ll be honest. I didn’t put the two together and probably wouldn’t have thought to do so, but the look was featured on the AT site– so I decided to trust them and order both pieces. You guys – they were made for each other! The color of the boat neck top picks up the lighter color thread in the skirt. It’s perfect! And how fabulous are the bell sleeves?!? I decided to leave the top un-tucked because it’s ribbed at the bottom…oh, and because you pull on the skirt. YEP. I said it. PULL ON. No hook. No zipper. AMEN. The skirt is SO comfortable, SO cute, and SO professional. I love anything tweed because of the texture it adds to an outfit. I just wish they carried it in more colors! I’m wearing a gray suede Vince Camuto pump from last season, but found this Sam Edelman pump that will look great! WHAT THE WHAT? You just pull the skirt on? WELL, THAT’S GENIUS!!!!! 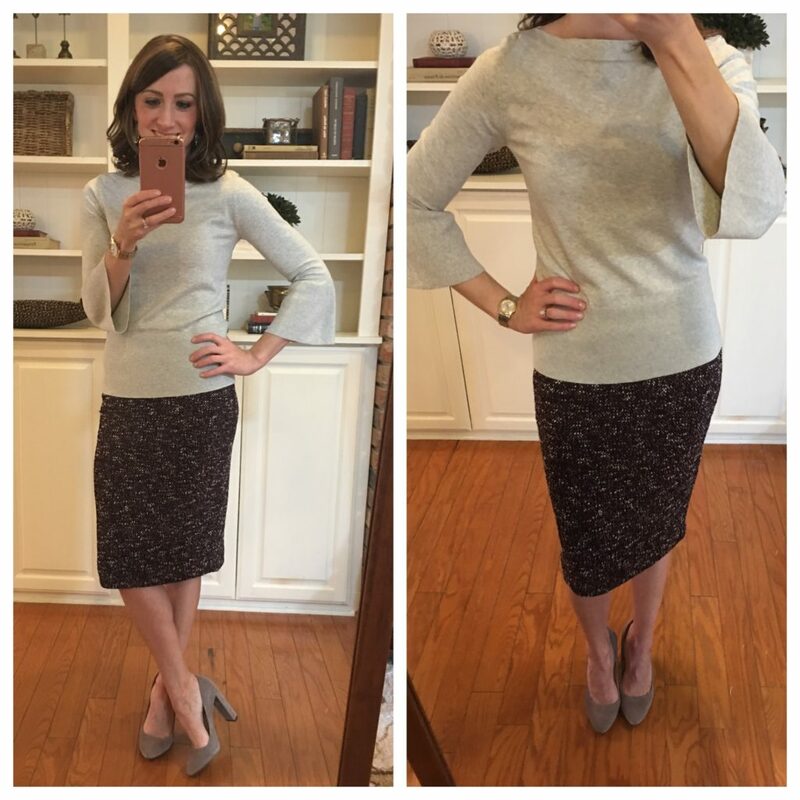 The sweater is ON SALE for ONLY $24.99, and the pencil skirt is ONLY $39.50!!!! That’s all of Conner’s outfits for today, but I want to re-visit this shot of her eyelashes from last week and give you some extra information! So, in review: use THIS for longer lashes. Now remember, her text said it took religious use for a good 2 months before she saw results…but HOLY MOLY, she definitely got results! Just be consistent, and it will pay off! And remember, I started using it last week, but I really do love how this product extends my lashes before I apply my mascara. SALE ALERTS! and SANTA ALERTS! That makes these boots ONLY $80.99!!!! The plaid shirt is ONLY $53.40!!!!!! The bag is ONLY $166.80!!!!!! 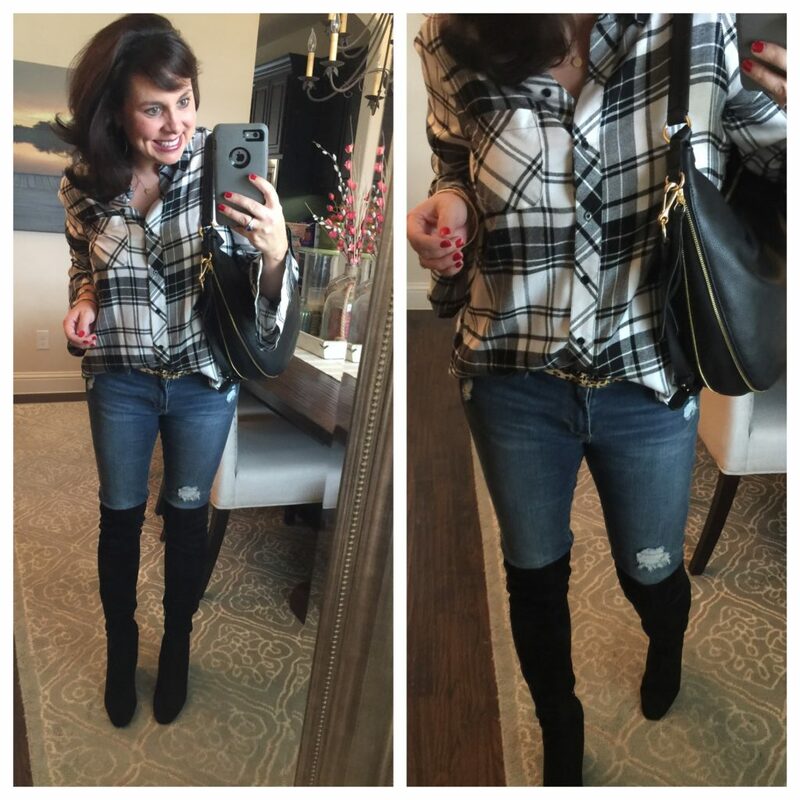 Click HERE to get back to the post to see full reviews of the boots, the bag, the plaid top, and the awesome puffer coat that is NOW ONLY $100.80!!! NOW ON SALE: If you follow me on facebook, then you saw me post these yesterday. The tall version of my slim profile UGGs are ON SALE in both black and whiskey!!!!! These are the MUCH IMPROVED version of the classic UGGs. They are still waterproof and crazy warm, but they have a slimmer toe bed and a tiny little wedge heel….and both updates make them wayyyyyy more flattering. I wear mine with jeans and leggings (and even pajamas at home). They are expensive, but I think they are 100% worth it. 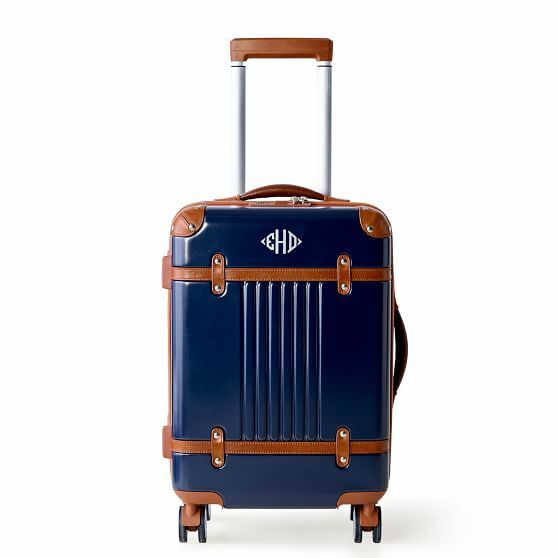 They are one of my top recommendations if you are looking to give a luxury gift to give somebody or ask for if you want a really nice (and functional) gift for yourself! Click HERE for the slim profile UGGs. 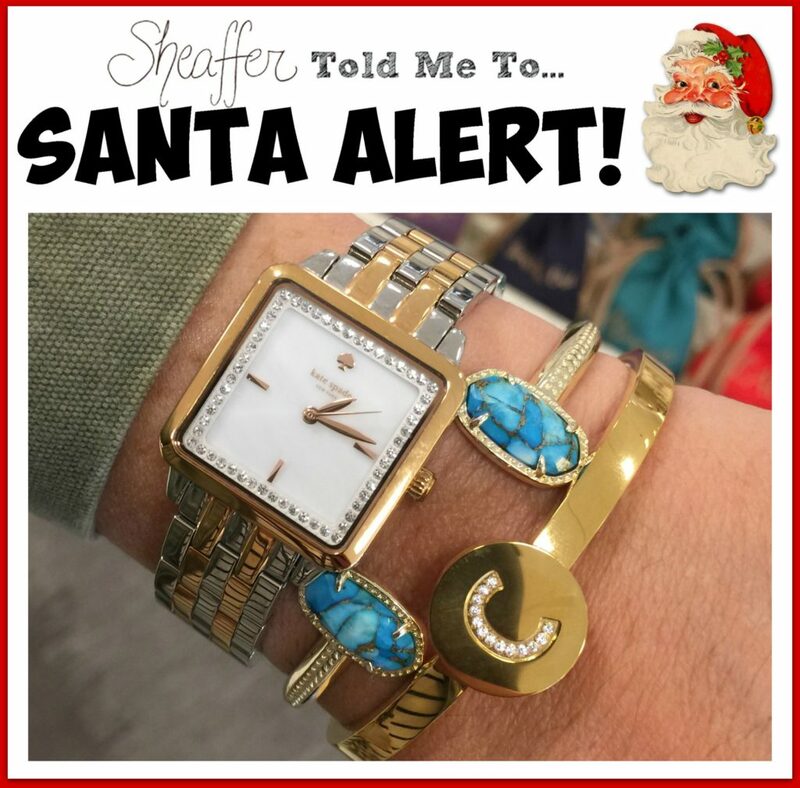 NOW ON SALE: I’ve already shared several Santa Alerts this season, and when I saw this initial bangle bracelet at the mall a couple of weeks ago, I knew it would make a fabulous Christmas gift! AND NOW IT’S 40% OFF!!! 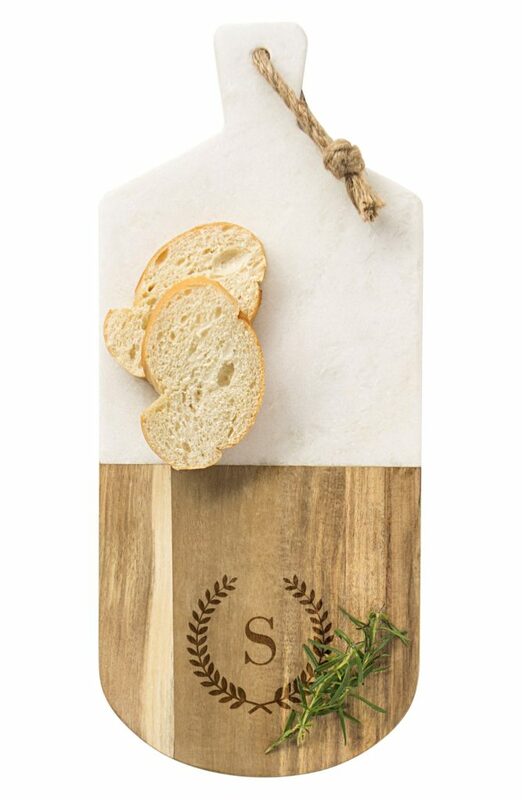 I love to give personalized gifts like this because they let the recipient know that some thought went into the gift. 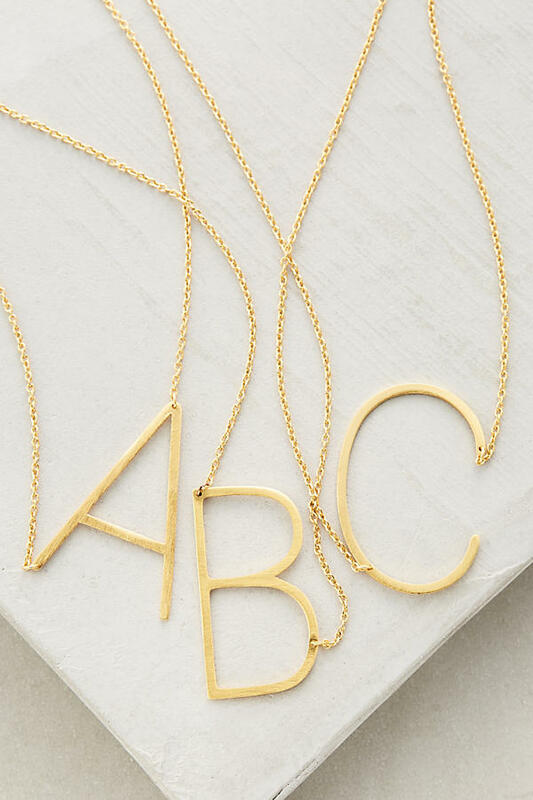 You could obviously give a person their own initial…or you could give them the initial of their significant other….or their child! Before y’all go today, I have a very important reader e-mail that I want to share with you. Nichole (a blog reader) wrote in to tell me about a good friend whose family is currently going through something unimaginable with their son. Please read the e-mail, and then please buy a tee or two to support this sweet family. I’m a long time reader (years!) and have always loved how you speak so openly about your faith (and your fashion finds!) It’s evident you have a heart for Jesus and for helping others. 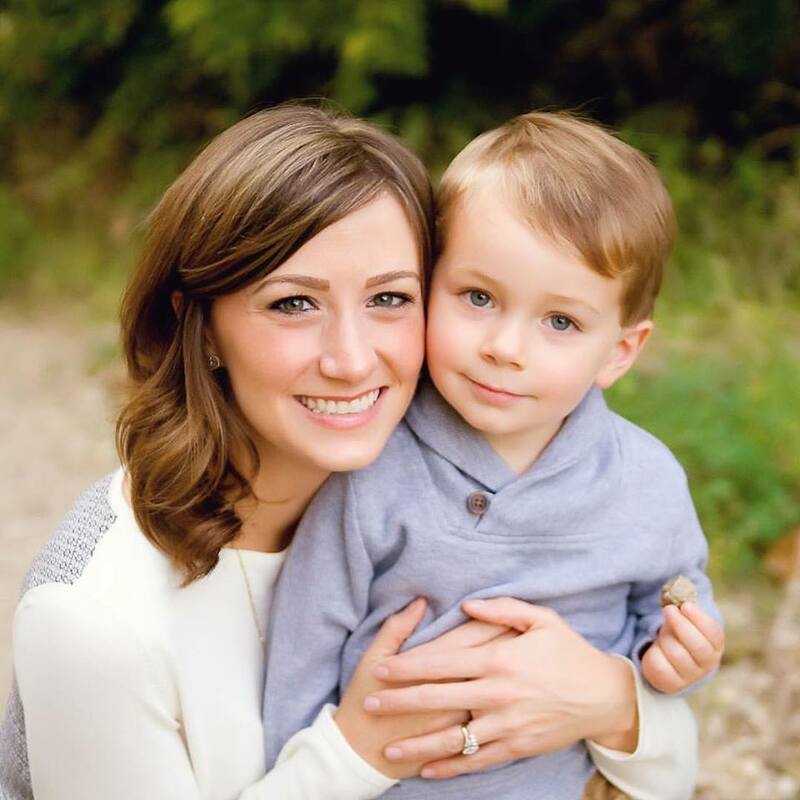 I have a precious friend whose family desperately needs prayers and I was wondering if you might prayerfully consider posting her story and a link to a t-shirt fundraiser we are doing for her family. Her son Andrew is the most adorable 8 year old with a contagious smile. He is currently in a battle for his life after being diagnosed with an extremely rare pancreatic neuroendocrine cancer. He has endured chemo already, along with surgeries, but they did not work. The family’s last resort is an experimental treatment called PRRT. Part of this treatment includes him having to be physically quarantined from other people for one week after the treatment. You can imagine the heartbreak this has caused for their family. So far he has gone through one treatment but has three remaining. These treatments are not covered by insurance and are extremely expensive. Andrew’s dad quit his job to be accessible for his many doctor appointments as well as be there to pick Andrew up from school early when his stomach pain becomes unbearable (which, sadly, is most days). On top of this, Andrew’s little sister has Down Syndrome and a heart defect and recently underwent her 6th open heart surgery. Through it all, this family shines their love for the Lord so brightly! They are so inspiring and are trying to use this horrible, awful, heartbreaking diagnosis to spread the gospel of God’s love. Their faith is being tested in a huge way and they have committed to praising God through the storm. I am trying to raise funds for their family this Christmas to help ease the huge financial burden they face. I’ve partnered with a local t-shirt company who has generously offered to donate the profits of these Christmas t-shirts to the Ross Family. Sales are through November 27th and the shirts will be shipped on the 28th (shipping is free). It would be so amazing if you could share this website link with your readers and we can all join in supporting this amazing family this Christmas season. If nothing else, I know this family would covet your prayers! Thank you so much for having a heart for others! Well, I of course e-mailed Nichole immediately and told her I would be honored to share Andrew’s story and the t-shirt site. The t-shirts are darling…so ladies, let’s all buy 1…heck, let’s buy several! 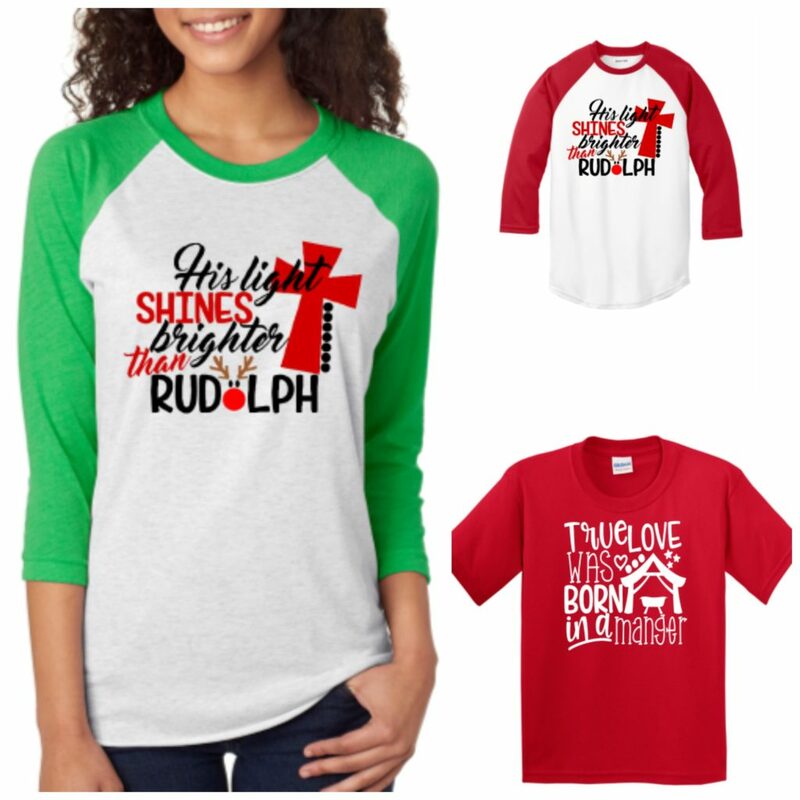 They come in 2 different designs, multiple styles, and men, women, and kid’s sizes. 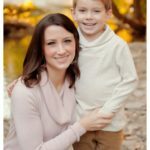 Nichole’s hope is to not only raise enough to buy their kids a few gifts for Christmas, but also to bless their whole family financially as they gear up for (hopefully) another round of PRRT after Thanksgiving. Y’all! Let’s help this family!!!!! You can click HERE to see the families blog if you want to get to know them a little better. I read several pages of posts, and Nichole was right, God’s love absolutely shines through this family. What a testimony they must be to those around them. Below you will see some of the tees, but click HERE to see all of them and to order! Let’s all BLESS THE SOCKS off this precious family by buying lots of tees and by PRAYING for Andrew! Nichole also let me know that if you would prefer to donate money instead of buy a t-shirt, you can e-mail her and she will get you connected to the right people. I didn’t want to post Nichole’s e-mail on the blog, so you can e-mail me at pinteresttoldmeto@yahoo.com, and then I can pass on Nichole’s e-mail to you. Conner always looks adorable!! I love her style!! ???? 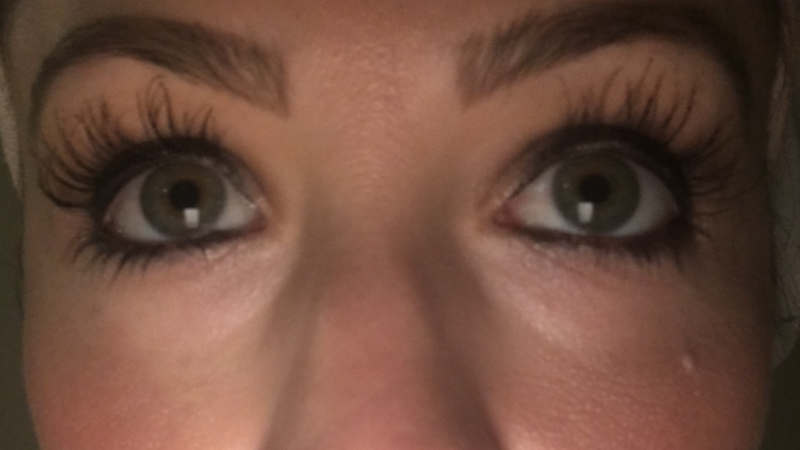 I live my work life in scrubs so no need for business attire, but those lashes??? Yes, please! 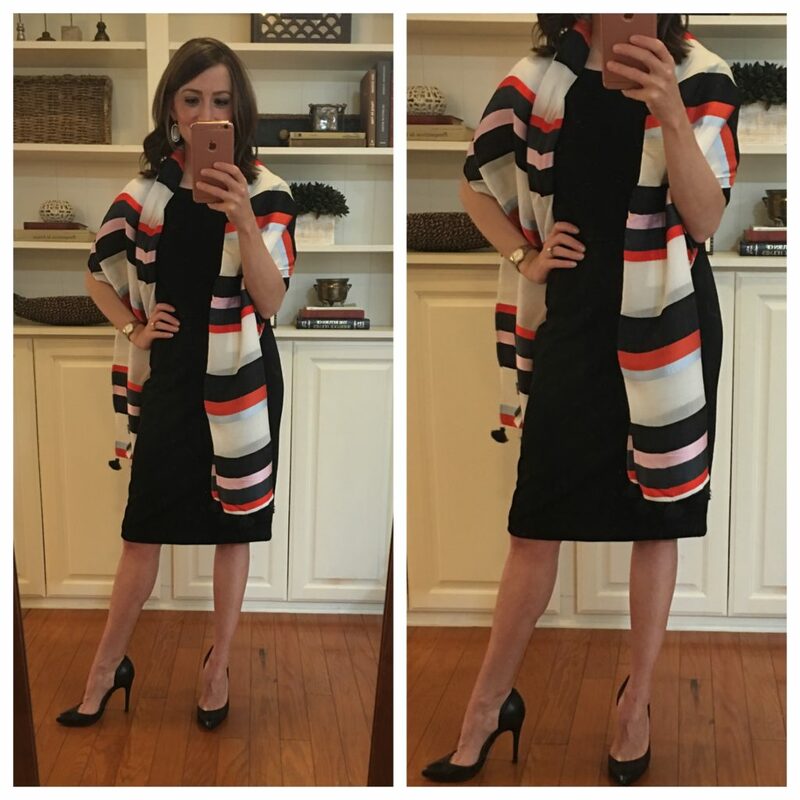 What brand are the black heels that Conner has on with the black dress and scarf?